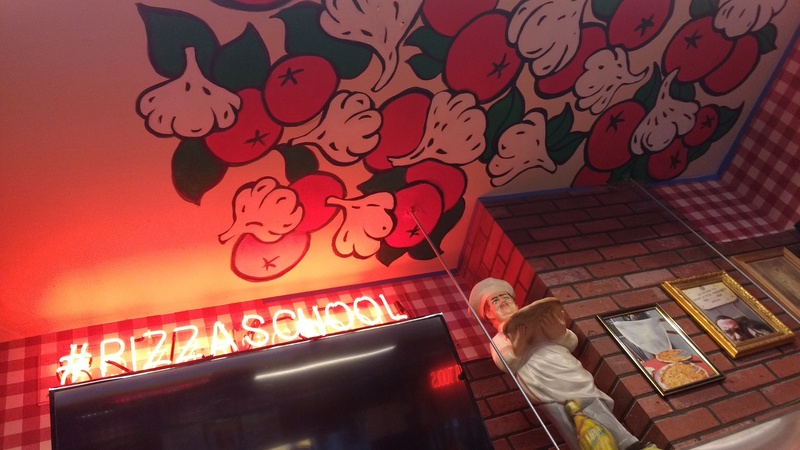 I flew down to New York City last month to do some mural work for one of my favourite clients, Famous Original Pizza School. Owners Mark and Jenny Bello hosted me in their energizing city while I painted ceiling and window treatments for the ever-evolving business. Painting the NYC cityscape in the Pizza School cellar. 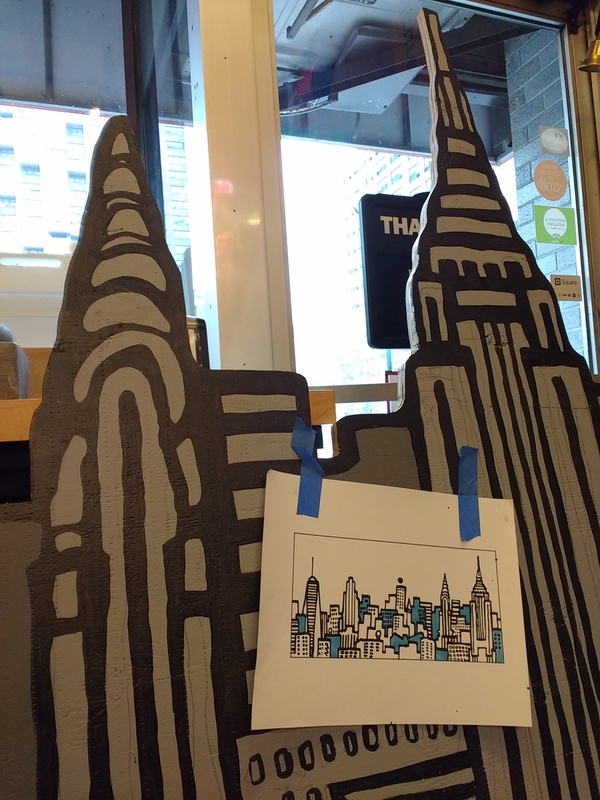 I painted a New York skyline for the front window, which will act as a backdrop for Pizza School’s mascot Senor Slice. I had to set up in the school’s basement to paint the plywood piece. It was a tight place to work, but Mark kept me motivated with a regular servings of pizza and a great music mix playing through a Frankenstein amplifier set-up. 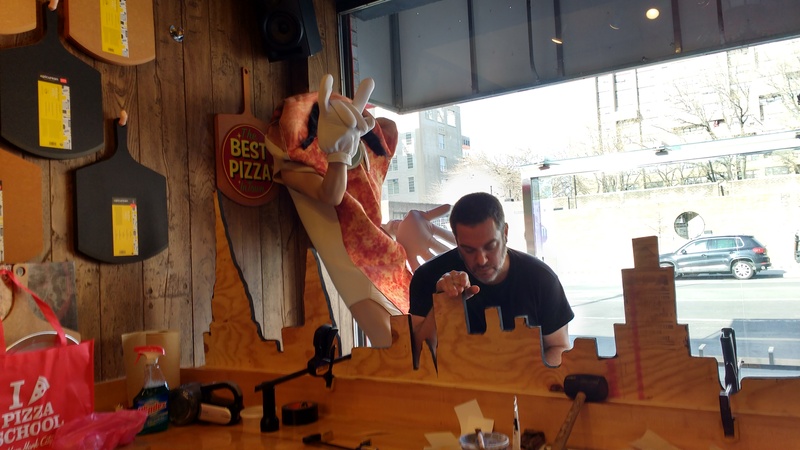 Working from a sketch on the Pizza School skyline cutout. 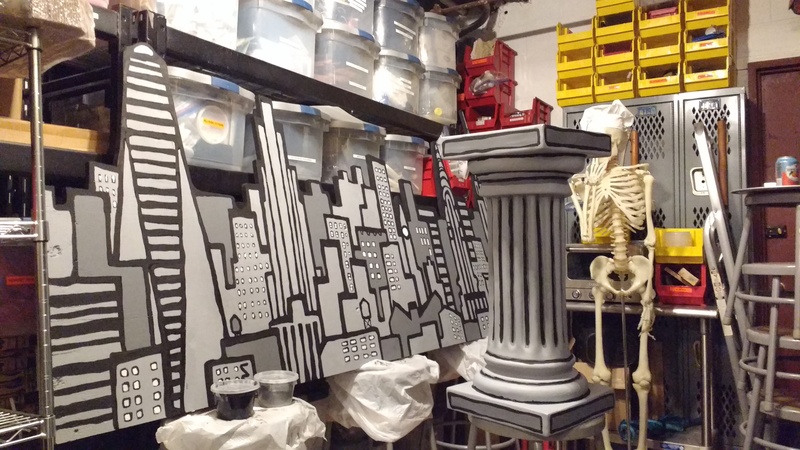 The install was a real gung-ho event, as we tried to finish it before my cab to La Guardia arrived. Mark and I have been collaborating together since the Swizzle Gallery tiki show in 2000, so we work as a good team under pressure. Mark installing the skyline with Senor Slice looming behind him. Garlic, basil, and tomatoes explode from the Pizza School ovens. As a bonus, I got to meet another Pizza School design regular, Steph Mantis, and work with her on some new merchandise displays. Check out her Forever Slice and other products, she’s has a clever mind! A trip to New York always fills me with a ton of creative energy for the year ahead. In this case, it also filled my suitcase with a fresh supply of black t-shirts (including a sneak preview of my Electric Peel cobra design)! 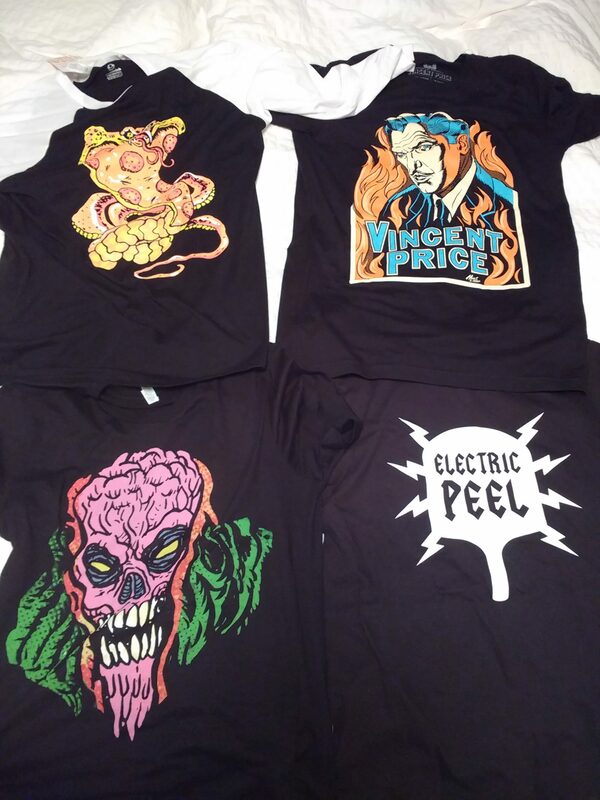 New black t-shirts, including Swizzle Studio’s cobra for Electric Peel. This entry was posted in Commercial, Projects. Bookmark the permalink.